In Matthew 19:14 Jesus said, "Let the little children come to me and do not hinder them, for the kingdom of heaven belongs to such as these." 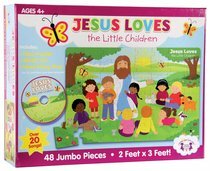 This beautifully-designed, 48-piece jumbo floor puzzle--for kids ages 4 and up--celebrates Jesus' love just for them! About "Jumbo Floor Puzzle With CD: Jesus Loves the Little Children (Incl Song & Activity Cd)"